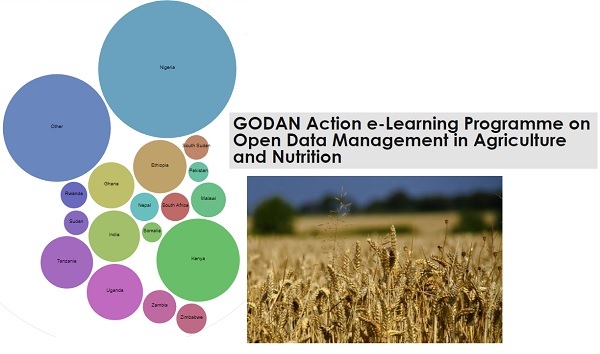 GODAN Action ended 2017 by delivering a new online course on open data management in agriculture and nutrition. GODAN Action has been offering various face-to-face training events to strengthen the capacity of data producers and data consumers to manage and use open data in agriculture and nutrition since 2016. As part of the capacity development activities planned by GODAN Action, the online course aims to reach and train a higher number of participants, geographically dispersed globally, and independently from time and a physical place. Thanks to the great interest in relevant communities, the call for the course attracted more than 500 applicants. As a result, over 200 researchers, data journalists, librarians, IT specialists, and policy makers from 29 countries were selected for this round of intake. The course was provided in English and delivered over 4 weeks from 13 November to 8 December 2017. Needs analysis for the course, curriculum development, and the content creation was a joint effort of GODAN Action project partners and it took nine months from inception to launch. The Open Data Management in Agriculture and Nutrition online course is an intense e-learning programme that covers every aspect of making data open and usable - from first principles to use, exposure, sharing and licensing of data. The content is structured into five units comprising eighteen lessons. The course is delivered using the Moodle open course management system, engaging users with online tutorials and forum discussions as well as live webinars which were also offered to a broader audience beyond the course environment. Lessons were downloadable allowing participants to read through the content offline, at a time convenient to them. The diverse background of course participants, geographically and professionally, richened the course content and leveraged knowledge exchange. Their working areas varied from weather and climate data to land, and nutrition data as well as other areas such as horticultural or aid data. We were really pleased with the active participation rate for the course which was over 83%. Respondents of the evaluation survey, which was conducted at the end of the course, stated that the course content met their needs and expectations. More than 97% indicated that they would recommend the course to their colleagues. “This course actually changed my perspective on what I really thought open data was all about. I have a deep understanding of it and I can confidently move on with the concept that is built with this course”. “I will definitely use the data validation, cleaning, visualization and skills for promoting innovation and utilization of data that I have acquired from this course”. “My first step after this course is to scope out ways to implement in my field and also transfer knowledge using the lecturing platform”. “Open Data Management course has been one of the most fulfilling data courses I have experienced. I am looking forward to applying what I have learnt in my practice as a researcher”. To reflect the high interest in the course, the GODAN Action team will offer similar programmes later in the year. Based on this year’s experience, we plan to tailor the e-learning programme for specific audiences particularly audiences working with land data and those who produce, use, manage and share open data. We will keep you updated about the upcoming programmes through our communications channels and on the GODAN website.